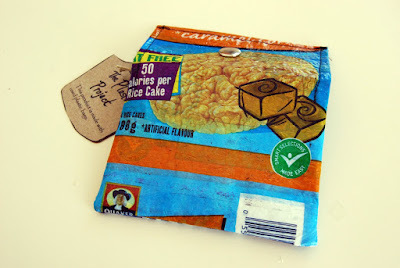 Thought a rice cake plastic bag would make a cute, little, snap button plastic pouch. 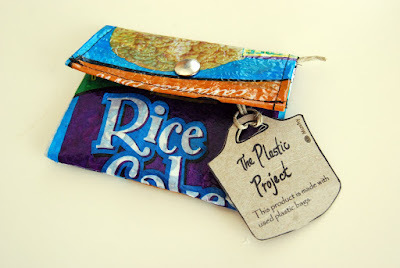 The Plastic Project's tag are printed on the back of cereal boxes to continue with the recycling and reusing theme. The back of the plastic pouch. Mmmm, caramel rice cakes. 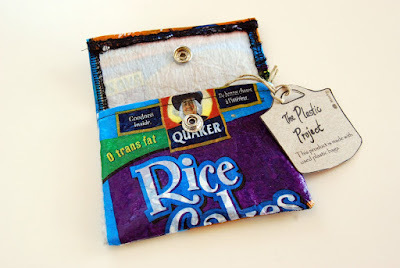 Look how happy the Quaker guy is to be recycled into a plastic pouch. you are insane! luv it! and i also luv the fact that your using cereal boxes too!! SOOOOOO COOOL!!! Keep em coming, I just love the amazement i get every time I see this stuff!